Kaluzhny, Irene [Ірина Калюжна], née Babyn – doctor, active in community affairs; born on 11 June 1899 in the village of Hadynkivtsi (Husiatyn raion, Ternopil oblast, Ukraine; at that time – Husiatyn county, Austrian crown land of Galicia); died on 19 March 1989 in Toronto, Canada. Irene Kaluzhny began her secondary education in Rohatyn and graduated from the Ukrainska akademichna himnaziia secondary school (gymnasium) in Lviv in 1919 (having moved to Lviv with her brother Mykhailo Babyn, who had been appointed as a teacher at the school). While still at the school she took part in the events surrounding the 1918 November uprising in Lviv, and later joined the Ukrainian Military Organisation. In 1921 she enrolled in the faculty of medicine of the Lviv (Underground) Ukrainian University, but intimidation and the threat of political arrest forced her to leave Galicia. She moved to Czechoslovakia and continued her studies at the Charles University in Prague. At this time she also became a member of the Ukrainian Physicians’ Association (Spilka Ukrainskykh Likariv) in Czechoslovakia. 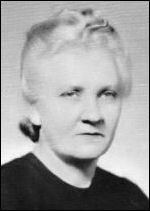 After gaining a medical degree in 1930 and undergoing specialist training in a number of clinics, Kaluzhny moved to Transcarpathia (part of Czechoslovakia at that time) where she worked as a doctor until 1939. She also gave first aid training at camps run by the Plast Ukrainian Scouting Organisation, organised courses on behalf of the International Red Cross and taught medical subjects in “civic” (lower secondary) schools. In January-March 1937 she ran a course for Ukrainian nurses, attended by 27 volunteers, in Khust (now in the Transcarpathia oblast of Ukraine). She also taught first aid at the volunteer nurses’ association and the local Prosvita society in Khust, as well as in Sevliush (now Vynohradiv, Transcarpathia oblast) and in a Plast camp (1934) in the village of Vyshnia Apsha (now Verkhnie Vodiane, Transcarpathia oblast). At the time of the proclamation of the independence of Carpatho-Ukraine in March 1939, and the subsequent occupation of the republic by Hungarian forces, she was living in Sevliush and in Khust. Choosing not to leave, she continued to work as a doctor in a hospital for wounded soldiers. After the hospital was taken over by the Hungarian authorities she worked in the Ukrainian Evacuation Committee in Khust, formed to facilitate the evacuation of refugees. In April 1939, together with other personnel of the Committee, she moved to Prague where she took part in the work of the local Ukrainian Relief Committee and other community organisations. After the entry of Soviet forces into Czechoslovakia in 1945 she was placed under arrest for a time. Following her release she crossed into Germany where she worked as a doctor in displaced persons camps in Bavaria. In 1951 Kaluzhny emigrated to the United Kingdom. Unable to continue her professional career owing to her age, she became involved in the work of Ukrainian community organisations. She served two terms as head of the Association of Ukrainian Women in Great Britain (AUW), from September 1957 to September 1958, and from October 1959 to November 1960. From September 1958 to October 1959 she was head of the AUW financial oversight committee. In 1959 (24-27 June) in New York she represented the AUW at the second congress of the World Federation of Ukrainian Women’s Organisations. In May-June 1958 in Oldham she gave lectures on health-related issues as part of a training course for Ukrainian pre-school nursery teachers. In 1959-60 she edited the monthly Zhinocha Storinka women’s feature in the Ukrainska Dumka newspaper. She played a significant role in the development of the AUW’s museum of Ukrainian folk arts which was opened in 1964 in Leicester (and later transferred to Manchester). In addition, together with her husband Rodion Kaluzhny (personal secretary to Danylo Skoropadskyj), she was active in the hetmanite movement in England. In the 1960s Kaluzhny emigrated to Canada and settled in Etobicoke (now a district of Toronto). She taught at courses on Ukraine, became a member of the United Hetman Organisation, and was active in the parish committee of the Saint Demetrius Parish of the Ukrainian Catholic Church in Toronto.